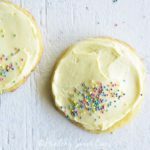 I searched for the best keto sugar cookies for a very long time. (And in the process I tried more recipes than I care to admit!) Keto baking can be quite finicky, and nothing yielded the result I was looking for. 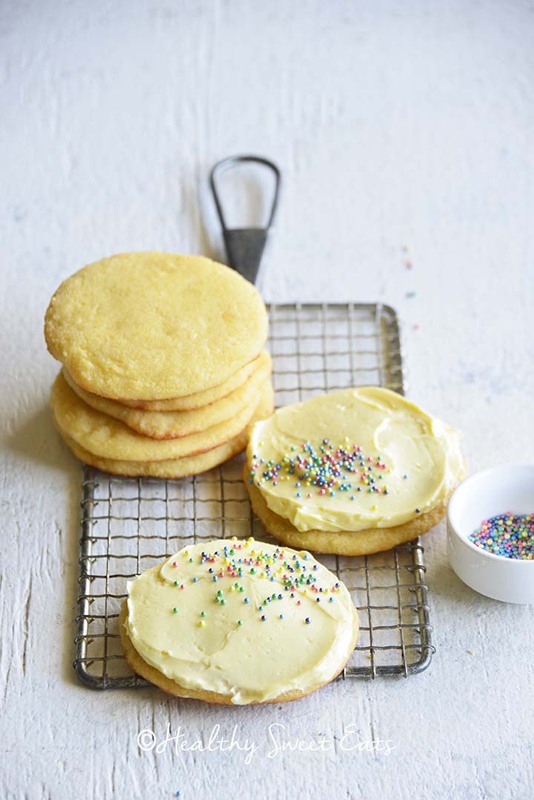 Finally I came up with this recipe for Soft Keto Sugar Cookies with Sugar Free Vanilla Frosting that’s as close to regular sugar cookies as I can get it! 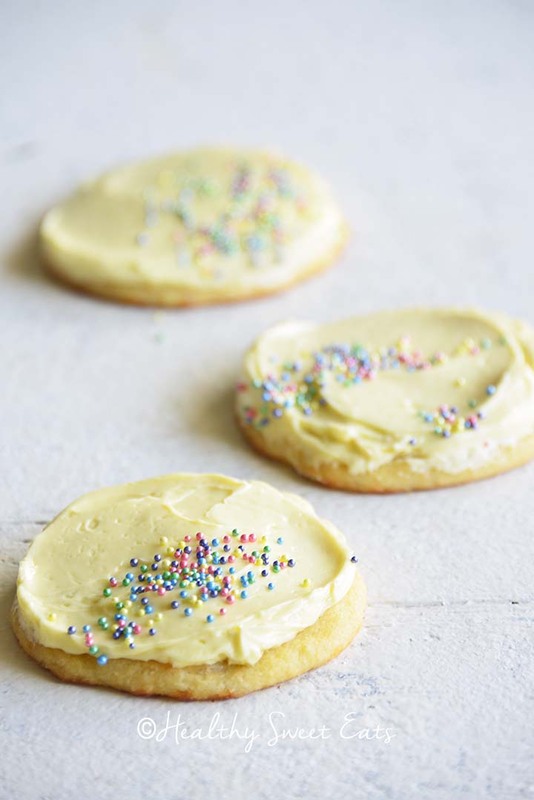 These cookies are soft and chewy, aromatic with vanilla, and laced with a touch of almond. 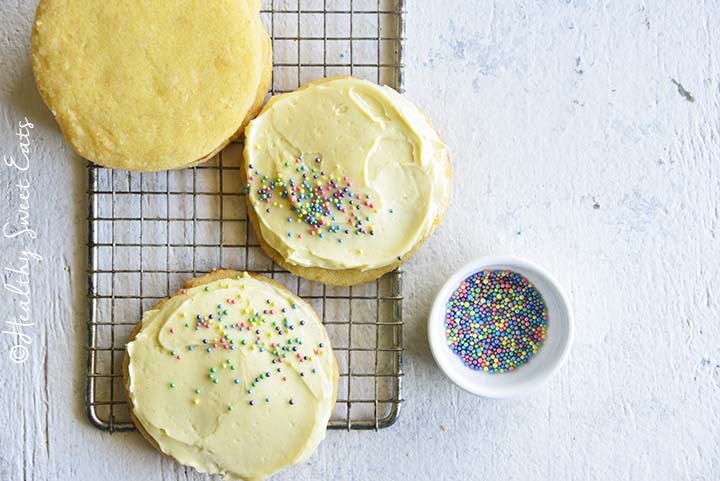 The buttercream is silky smooth, not too sweet, and rich with healthy fats. The best part is, you can have fun decorating these cookies to fit the season! 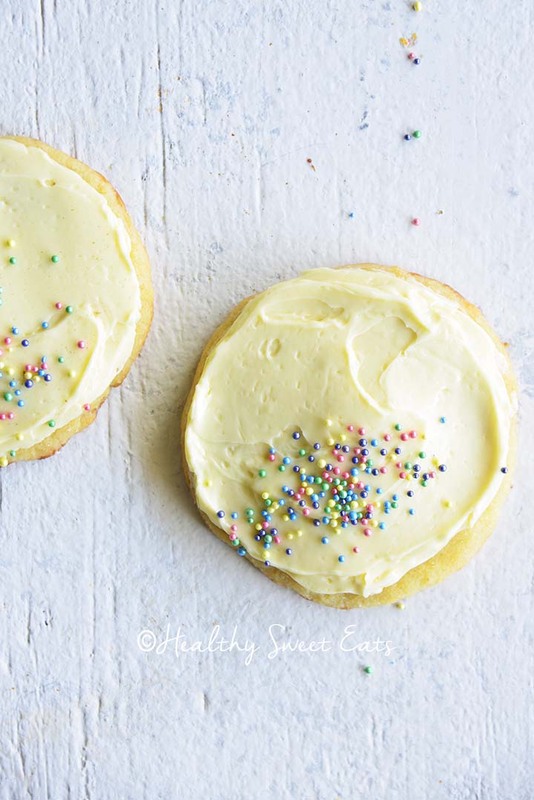 Here I went with pastel nonpareils for a spring theme, but you can decorate these cookies for Christmas, Thanksgiving, birthdays, or any other celebration you can think of. 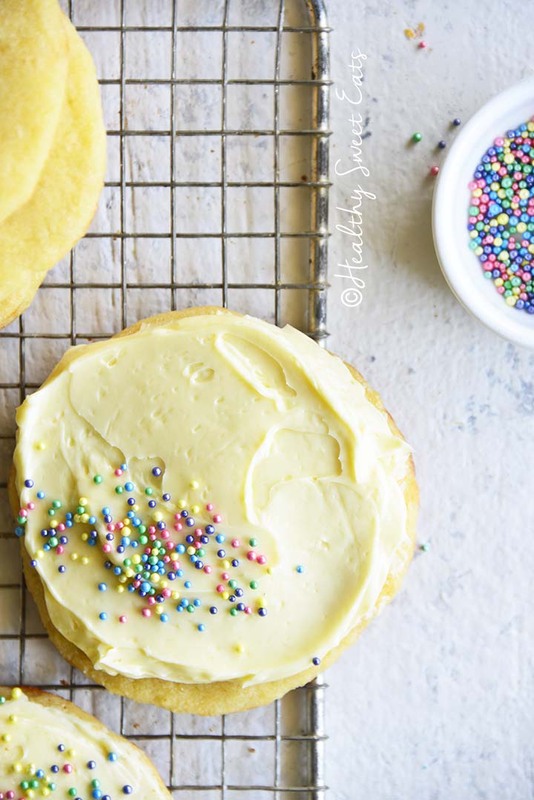 The texture of these Soft Keto Sugar Cookies with Sugar Free Vanilla Frosting is soft and chewy with a slightly crisp bottom. They are surprisingly very similar to regular cookies! They’re laced with vanilla and a touch of almond extract. I also add sour cream because that’s my mom’s secret ingredient in her regular cutout cookie recipe to give the cookies a soft, tender crumb. Beef gelatin lends a slightly chewy factor to these cookies, and don’t worry, you can’t taste it! If you’re looking for a vegetarian substitute for beef gelatin, you may want to try agar agar (if you try it, please let me know how it goes in the comments below!). Sour cream helps keep these cookies moist and chewy. 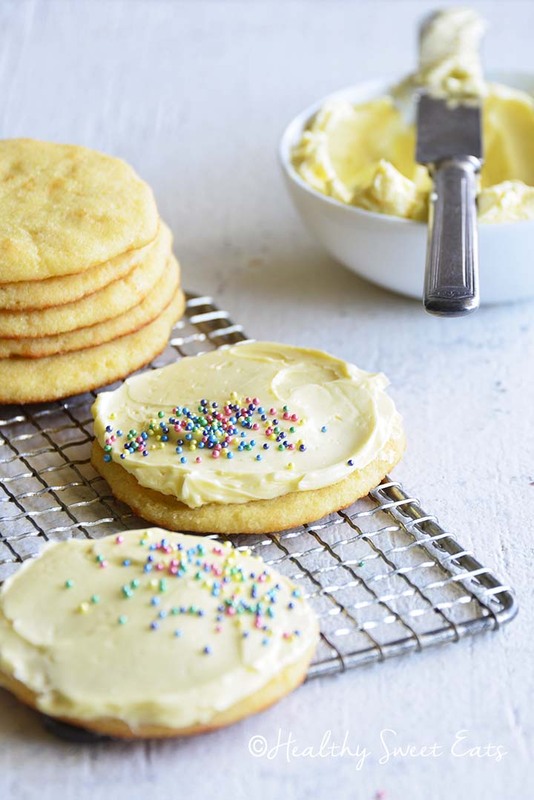 Part-skim shredded mozzarella melted and combined into the dough is what really gives these cookies their soft texture! Make sure you buy this kind of mozzarella (part-skim, pre-shredded) because the cheese that you shred yourself will have too much moisture for this recipe. I used the idea behind fathead dough to make my Soft Keto Sugar Cookies: using melted mozzarella in the cookie dough! In the keto world, fathead dough is extremely well known, and it’s usually used to make pizza! It’s basically just part-skim shredded mozzarella cheese that’s melted and combined with a keto-friendly flour, such as almond flour or coconut flour. Different recipes add different flavors; for example, if the dough is for pizza, the recipe might add dried Italian herbs. 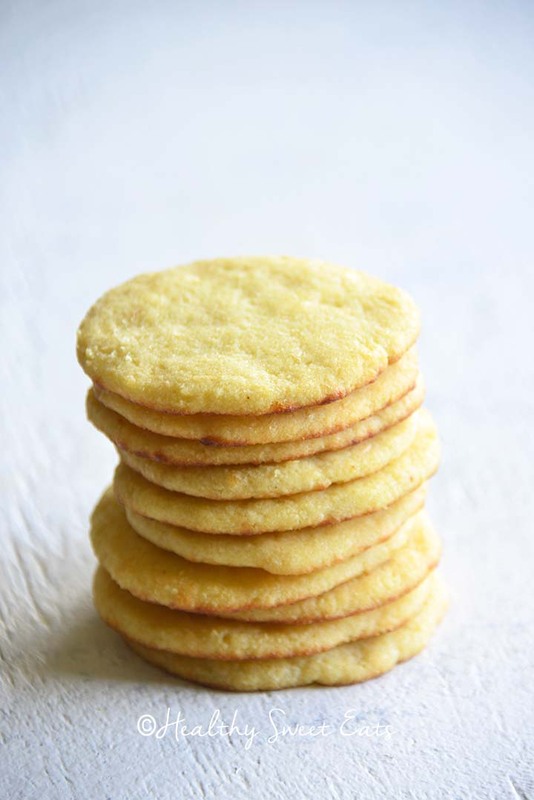 To make fathead dough into these Soft Keto Sugar Cookies, I add vanilla extract, almond extract, and sweetener. As for the history behind fathead dough, Tom Naughton’s oldest brother’s oldest son created it, and named it after his Fat Head movie. Can I Eat a Cookie on Keto? There are a lot of recipes for keto cookies out there! Scroll down because I link to a few of my favorites in this post. You can also do a quick Google search for “keto cookie recipes”. On the other hand, if the real question is whether you can eat a regular cookie on the keto diet, the answer to that is a little different. The point of a ketogenic (i.e., low carb high fat) diet is to maintain a state of nutritional ketosis so our bodies run on fat instead of on carbs. We can achieve that by determining our macronutrient needs (macro calculators are helpful for this! ); macronutrients are calories, protein, fat, and carbs. Check the macronutrients for the cookie you want to eat, and see if you can fit it into your macros for the day; if so, go ahead and eat it! How Can I Eat What I Want on Keto? I don’t consider any foods to be “not keto”. Personally, I try to focus on nutrient-dense real-foods that are naturally high in fat and low in carbs. 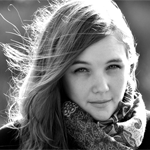 These are things such as grass-fed dairy, eggs, avocados, healthy fats (like olive oil, avocado oil, grass-fed ghee, etc. ), grass-fed beef, free-range chicken, and non-starchy vegetables (for example, leafy greens and cruciferous vegetables). And yes, there are foods I try to avoid, but in the end it’s about whether you can fit a food into your daily macronutrient requirements. This is where portion size becomes extremely important. For example, say you have a bulletproof coffee for breakfast, two roasted chicken thighs with half of a cup of garlic-sautéed spinach for lunch, and a bunless cheeseburger (just meat and cheese) topped with half of an avocado for dinner. Your carb intake for the day would be pretty low, right? (Remember that net carbs = total carbs – fiber – sugar alcohols.) Depending on what your macronutrient requirements are, at the end of a day of eating like that, you will probably have a few carbs to play around with. Meaning, go ahead and have that spoonful of peanut butter (measure it! ), half a chocolate chip cookie, small serving of ice cream (weight it! ), or whatever “non-keto” food it is that you want to have that will fit into your daily macronutrients. I’ve noticed that the moment a certain food becomes “off limits”, “not allowed”, “bad”, or “not keto” is the moment it’s all I can think about. Instead of adopting this mentality, I choose to limit non-nutritious high-carb foods and focus on eating nutrient-rich, naturally low-carb high-fat foods. I make it my choice to want to nourish myself. However, if I’m craving a particular food (for example, lasagna), I will either find a way to make lasagna keto, or I will find a way to fit a small portion of regular lasagna into my meal plan for that day (by lowering my carb intake at other meals). My low carb biscuit recipe has been a lifesaver for me and is a regular staple in my kitchen. Can You Cheat on Keto? Nutritional ketosis has the effect of stabilizing your blood sugar so your cravings will be reduced (so you may not be tempted to cheat!). If by cheating you mean eating whatever you want without regard for your macronutrient requirements so that you kick your body out of ketosis, I don’t recommend this. The reason is, once you’re out of ketosis your body will again have to burn through the glucose in your bloodstream as well as your glycogen stores before you get back into a state of nutritional ketosis. And yes, this takes a few days and you may experience the “keto flu” again! Ugh, lol. Read more about the topic of cheating on a keto diet on Diet Doctor, Delish, and Ketologic. Mix together the beef gelatin and boiling water in a small bowl and stir to dissolve; set aside. Cream together the butter, sour cream, Swerve Confectioners, egg, vanilla extract, almond extract, and stevia glycerite in a large bowl and set aside. Beat in the dissolved gelatin. Whisk together the almond flour, coconut flour, and baking powder in a medium bowl. Melt the mozzarella cheese in a microwave (in 30 second increments) or in a double boiler. Add the almond flour and mozzarella cheese to the butter mixture and stir vigorously to combine. It might be helpful to knead the dough a bit with oiled hands to help it come together. Form the dough into a ball, flatten it slightly into a disk, wrap it in plastic wrap, and refrigerate until chilled (about 2 hours in the fridge or 20 minutes in the freezer). Preheat the oven to 350F and line 2 large baking sheets with parchment paper or silpat liners. Roll the cookie dough out between 2 pieces of parchment paper to a circle about 1/4-inch thick. 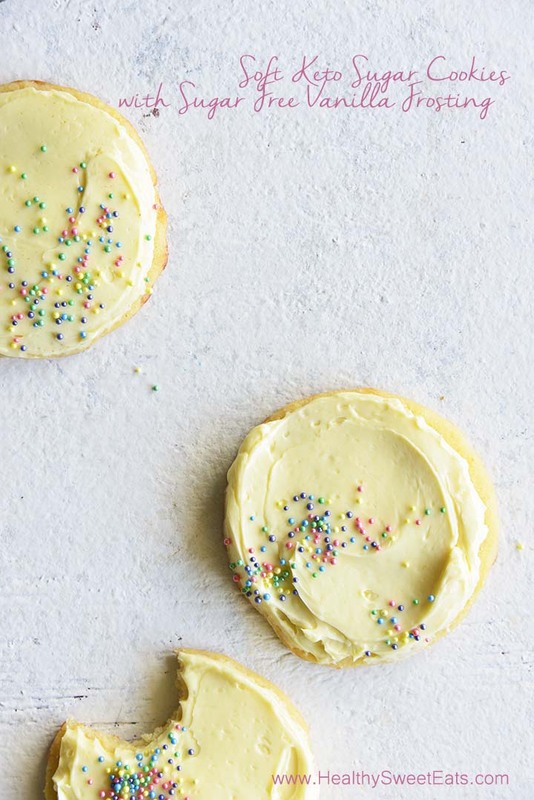 Use a cookie cutter in any shape you like to stamp out the dough into cookies, and then gather the scraps, re-roll, and repeat until the dough is all used. I used a 3-inch circle cookie cutter and got 12 cookies. Arrange the cookies on the prepared baking sheets and bake until golden on the bottom, about 12 to 15 minutes, rotating the trays once halfway through. Cool completely before frosting. Add the cream, egg yolks, Swerve Confectioners, stevia glycerite, and salt to a small saucepan over medium heat. Cook until the mixture is thickened, about 3 minutes, whisking constantly. Cool to room temperature and then chill. Use a handheld electric mixer to cream the butter and vanilla together in a large bowl. Beat in the chilled cream mixture until light and fluffy.